Betvictor have been independently verified as having the best odds on football (soccer) and a best odds guarantee is also available on horse racing. Bet £5 get £30 on sign up and a rock solid reputation. » Best football odds bar none. » Best odds guaranteed for horse racing. » Slightly smaller than average joining offer. » Bonus split £20 sports £10 casino. » Only live streams for horse racing. New Customers only. Deposit and place a £5 qualifying bet at odds of 2.00 or greater within 7 days of opening a new account; excludes cashed out bets. Receive 2x £10 Free Sports Bets, valid on set events only (1 at odds 2.00 or greater), expires in 7 days, plus a £10 Casino Bonus, expires in 7 days. Wager the Casino Bonus 40x to withdraw winnings. Credit or Debit card only. Geographical Restrictions. T&C apply. All new Betvictor customers can take advantage of a welcome promotion which provides a £30 in welcome bonuses (£20 sports and £10 casino) with the company, when they bet just £5 after joining. To qualify for the bonus, the initial bet must include at least one selection at odds of evens or greater and be £5 or more. The bonus funds are credited within two working days, are split into £10 chunks for different bet types and £10 in casino bonus cash. They expire after a period of 30 days from when the initial matched bet was placed. If any winnings result from bonus fund stakes, the stake will not be returned and in order to be able to withdraw those winnings the customer must have staked a total amount equal to four times the bonus amount (sports) and have had those bets settled. Any problems or questions with the bonus offer? Read our Betvictor free bet guide. Acca Insurance – Available for both football and for tennis accumulators, Betvictor offer what they call ‘Acca Insurance’ to protect against one leg letting down a whole bet. For football, customers’ stakes are refunded as a free bet up to a maximum of £25 if one leg of a five + selection acca fails, whilst the maximum available is £50 for tennis. T&C’s apply. ‘Instabet’ Enhanced Prices – Betvictor’s downloadable ‘Instabet App’ offers limited time only enhanced prices on a range of major sporting events. T&C’s apply. Guaranteed Run for your Money – An offer applying to all British and Irish horse races, Betvictor refund all losing bets when a horse refuses or whips around, fails to come out or otherwise loses all chance at the stalls. T&C’s apply. Best Odds Guaranteed – Betvictor will always give you whichever is the better price out of the price you took when placing your horse racing bet or the starting price. T&C’s apply. To see all current promotions visit Betvictor and click the ‘Promotions’ tab! 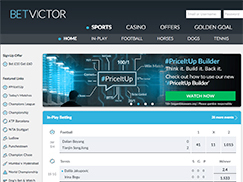 In-Play Betting – The Betvictor site has a comprehensive section dedicated to in-play betting, which features a huge selection of events and markets from all kinds of sports all over the world. In-Play Stats and Visuals – Within the dedicated in-play section, Betvictor provide live scores and basic stats for each and every one of the events with available markets. For most football matches and other popular events, there are also more in-depth visuals such as action areas and basic text commentary provided. Horse Race Live Streaming – Horse racing punters can live stream any race from the UK, Ireland, South Africa or the UAE through Betvictor on their desktop or mobile as long as they have staked at least £1 or €1 on the race. Cash Out – A relatively new feature for Betvictor, the company do now offer a cash out option for bets on a variety of markets within the sports of football and tennis. The Betvictor service is fortunately not only available to desktop users and can also be accessed by punters with any kind of mobile device that has internet access. That excellent compatibility comes from the fact that Betvictor’s is a mobile web app accessible via any browser, available without the need for download and compatible with Apple devices thanks to not using Flash. The app itself is easy to understand and to use, and includes a number of handy features to aid quick navigation and the location of individual markets. There is also mobile capability for streaming horse races in the same way as you can via the desktop but the one downside to the mobile app is that it can sometimes be rather slow to load and to move from one market to another. One of the goliaths of the online bookmaking world, Betvictor have been in the business of gambling since as far back as 1946 and in their 70 plus years of operation have developed an excellent reputation with the general punter. Viewed as trustworthy and reliable, Betvictor have a huge customer base that is largely UK-centric and an enviable reputation for offering great value – especially when it comes to the prices offered for football betting. One of the many things that has helped to build up the companies reputation and a strong reason why they score high in this review of Betvictor, is the sheer number of safety and security measures that they put in place to protect not only finances and financial transactions but also the wellbeing of their customers. In terms of deposits, withdrawals and other transactions, Betvictor ensure security by way of fully encrypted data transfer, multiple redundant servers and the comprehensive checking of all cards to ensure their validity. To help protect customers and ensure responsible gambling meanwhile, Betvictor also offer self-exclusion periods of between six months and five years – as well as a permanent option – and allow users to impose deposit limits on their own accounts to manage the amount they’re gambling in a particular time period. Betvictor offer their customers what they call a ‘24/7 customer service centre’, which allows anyone with a problem or question to seek assistance in three different ways. The company can be emailed with an enquiry, complaint or question on the address which is listed below, or can be contacted via online live chat which is available 24 hours a day. What’s more, customers can also request a call from Betvictor customer services at any time between 10.00 and 22.00 CET by filling out a form on their website. The overall bookmaking service provided by Betvictor is certainly one of the most impressive around and is one which will certainly appeal to the vast majority of casual punters thanks to its good value and user friendly nature. Betvictor are also second to none when it comes to the breadth and variety of markets that they offer and provide an exceptionally comprehensive, easy to use and attractive in-play betting service both on desktop and mobile. The live streaming of horse races available is another plus but the fact that Betvictor haven’t yet extended this to other sports is a slight downside. Having the same live streaming capability through their mobile app is certainly a plus and the app as a whole is also easily navigable. Betvictor are certainly a very good and reliable bookmaker but there are a few small things which could be improved to enhance customer experience yet further, including their cash out function, speed of their app and breadth of live streaming options. What is possible the most notable area where Betvictor can be seen as falling behind some competitors however, is that of promotions and bonuses. Their welcome offer for instance, is by no means the most generous around and their variety of other promotions is comparatively lacking when compared to some (Bet365 & Paddy Power). Disagree with our Betvictor review or have a question? Use our contact page to get in touch.